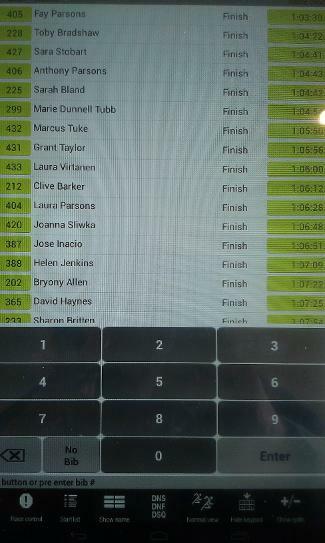 Our race timing system will save event organisers hundreds of pounds when compared to Chip Timing and is just as accurate for medium sized events. It works be recording runners bib numbers as they cross the line on our timing computers, this is then posted LIVE to our timing webpage every 15 seconds so runners, family and friends can view their times straight after the race. We can work with multiple wave starts and multiple distances all taking place simultaneously. We have timed one of our own events which involved 600+ runners starting in 7 waves, across 5 different events and we were able to record all the runners as they crossed the line. Our system is perfect for up to 500 runners taking part in a 10km distance in a mass start. If you have more runners in longer distance events, or starting in waves, then our system is still perfect for you. Please get in touch to discuss your event, receive a quote and make a booking. Our prices are extremely competitive and will be significantly (typically 50% cheaper) than chip timing at just £1 per runner! (minimum £250). For example a race with 150 runners would be £250. A race with 300 runners would be £300. If you would like to hire a race clock alongside our timing services then we can offer this for just £75, down from our usual £100. Travel expenses in addition at 45p per mile from Bath, BA1 plus overnight accommodation where applicable.